Inexplicata-The Journal of Hispanic Ufology: Chile: A Rest Stop UFO? 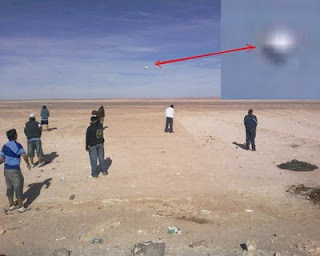 Proof that there's no telling where or when an unidentified flying object will be seen and/or photographed: Our colleagues at Chile's IIEE have posted this image (from the "La Estrella de Arica" newspaper) dated February 17, 2010. It appears that fans of the San Marcos de Arica soccer team, on their way to Antofagasta for a match, paused their bus to relieve themselves -- oblivious to the object overhead.